When I think of Chelsea Quinn Yarbro, it’s usually in the context of her hugely successful Count Saint-Germain novels, the tales of gentleman vampire Saint-Germain and his adventures down through the centuries, beginning with Hôtel Transylvania (1978). 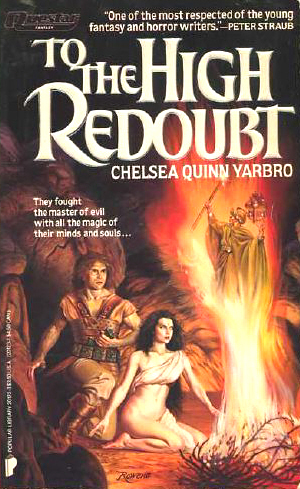 Yarbro’s 26 novels featuring Saint-Germain have covered a lot of historical ground, from the reign of emperor Heliogabalus in 3rd century Rome (Roman Dusk) to his escape from Genghis Khan in Tibet and India (Path of the Eclipse), 6th Century China (Dark of the Sun), and the rise of the Nazi party in Germany (Tempting Fate). The most recent, Commedia della Morte (March 2012), finds our dark protagonist in France during the Reign of Terror of the French Revolution. But Yarbro has had a very successful career as a noted fantasist quite apart from her Saint-Germain books, with some 65 novels to her credit, including Time of the Fourth Horseman (1977) and A Baroque Fable (1986). Two of her earliest novels, The Palace (1979) and Ariosto (1980), were nominated for the World Fantasy Award, and in 2003 she was named a Grand Master at the World Horror Convention. In 2005 the International Horror Guild named her a “Living Legend,” and in 2009 she was presented with a Bram Stoker Lifetime Achievement Award by the Horror Writers’ Association. The Bundhi — Lord of Darkness, stealer of souls. This master of evil had destroyed all who fought against him, all but the beautiful Surata, last surviving adept in tantric alchemy. From Surata he had taken family, vision, and freedom, selling her into slavery in a distant land. But even the Bundhi could not comprehend how deep Surata’s power flowed, even he could not foresee that destiny would bring Surata her champion, Arkady, soldier of fortune. United by a growing trust, and their astral crusade against the deadly forces of the Bundhi, Surata and Arkady rode forth to challenge their enemy in the very heart of his empire, racing against both time and terror. To the High Redoubt was published by Questar in 1985, with a cover by the fabulous Rowena Morill. It is 370 pages of promising 80s fantasy. I’ll let you know if it’s any good.